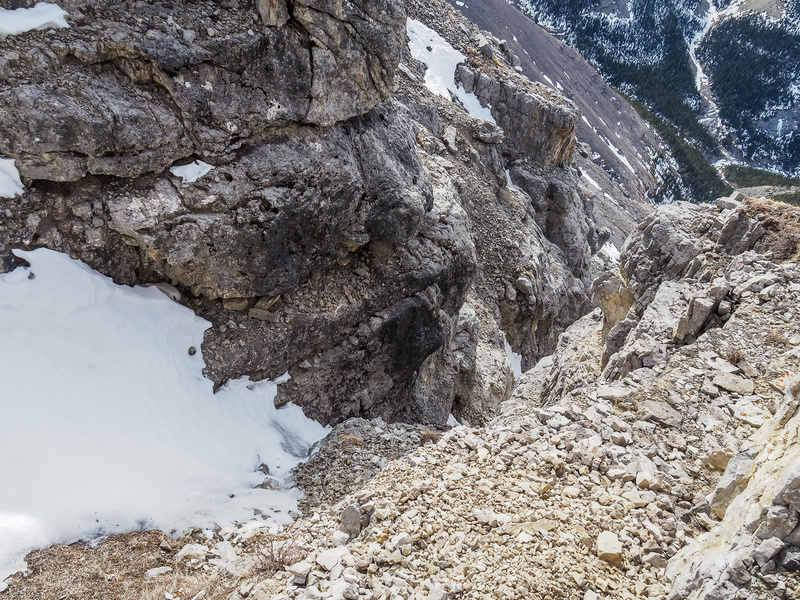 Quick ‘n Dirty Rating: Class 2/3 – you fall, you sprain or possibly break something (east ridge route). Difficulty Notes: By “Kane standards”, this is a moderately difficult scramble with some route finding. Easiest route is via Association col on ascent or if just doing End, ascend and descend the east gully system which is moderate. 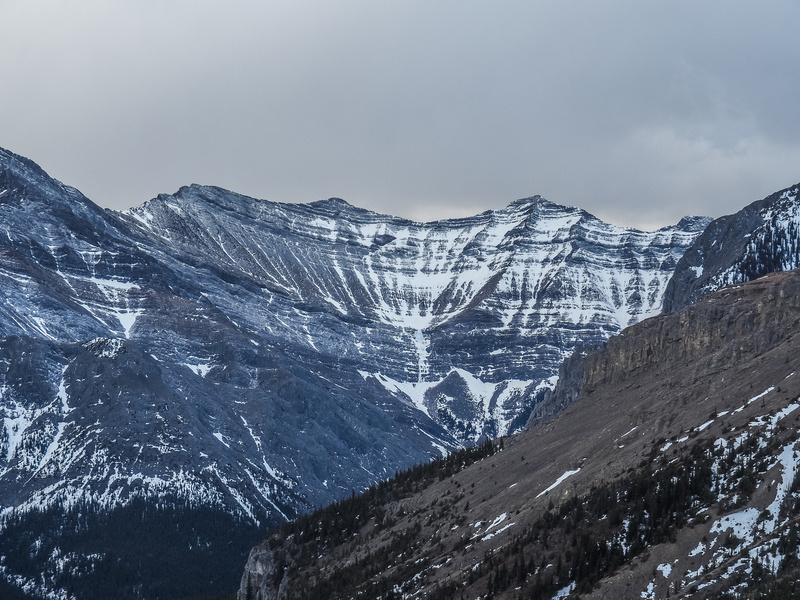 NOTE: If doing the traverse via west slopes to Association Peak, there is a steep chimney to negotiate which is 4th class and *not* a “moderate scramble”. On Saturday, March 05 2016 Mike Mitchell (Giant’s Gate Journeys) and I left my truck (parked the wrong way on a one way for some reason…) at the Yamnuska parking lot and headed off up an obscure cut line on an adventure to scramble End Mountain and hopefully Association Peak and Hill along the way. 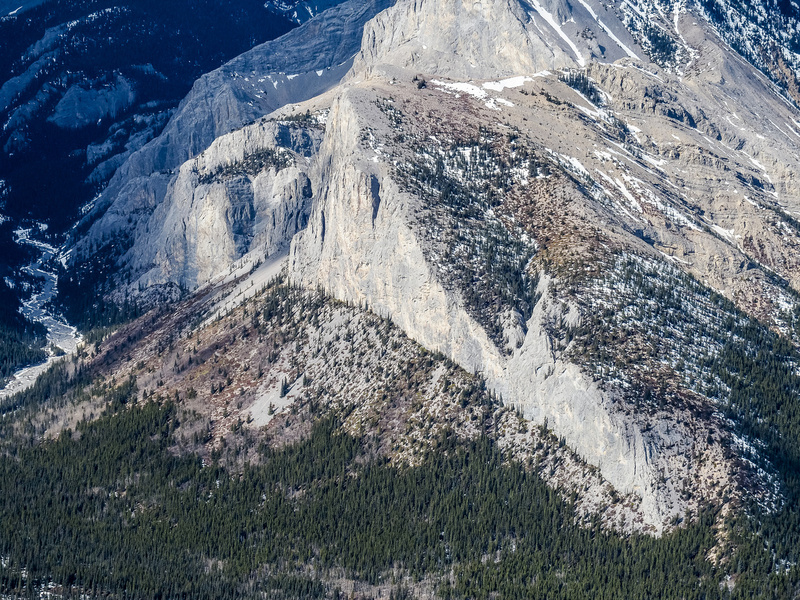 Alan Kane and Kris Thorstenstein scrambled both of these peaks in 1989 via the Yamnuska (Yam) shoulder, and for some reason neither of them appeared in Kane’s scramble book. Apparently the latest & greatest way to approach these two mountains on the eastern front ranges is to access them from easy approach roads via First Nation’s land to the east with a free permit that must be obtained beforehand. 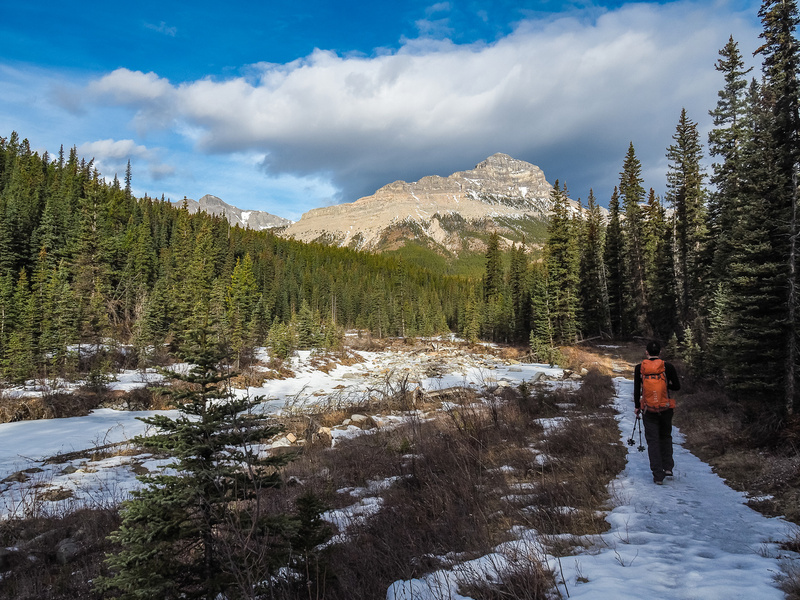 Since Mike and I didn’t have a permit, we chose to access them the semi-hard way – via the Yam shoulder and old roads around the east end of the shoulder. 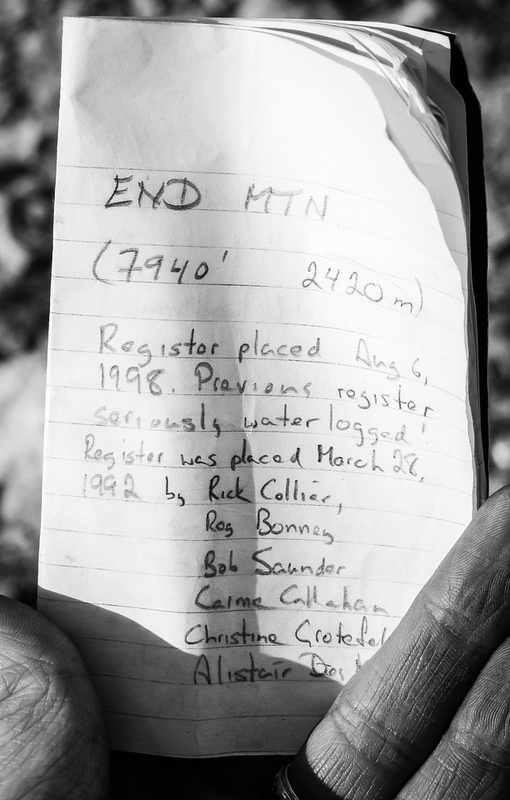 Back in 2008, Raf Kazmierczak followed Bob Spirko’s 2007 ascent route up Association Peak and attempted to traverse the ridge to End Mountain, roughly 1.5 kilometers to the north. 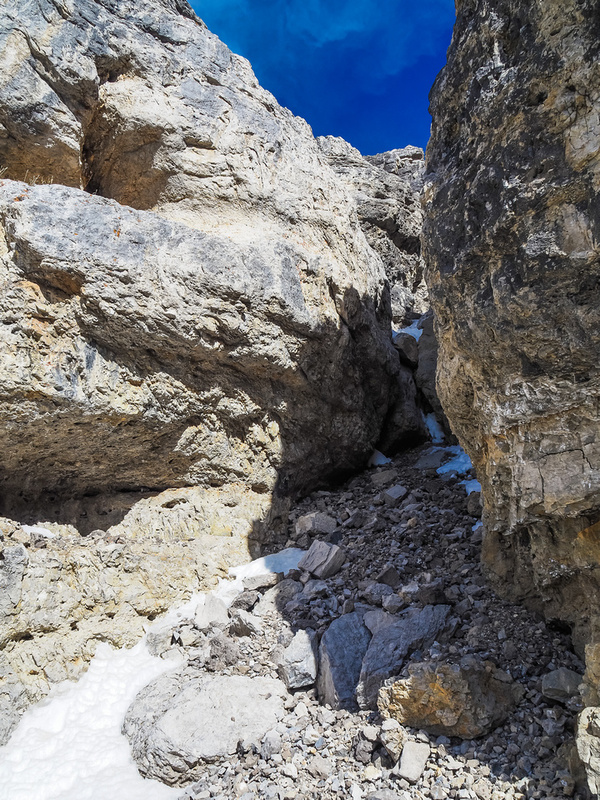 Raf confidently stated that the traverse was “not doable” due to a series of large gaps requiring technical mountaineering and a “mother of all gaps” stopping even a roped team from continuing. 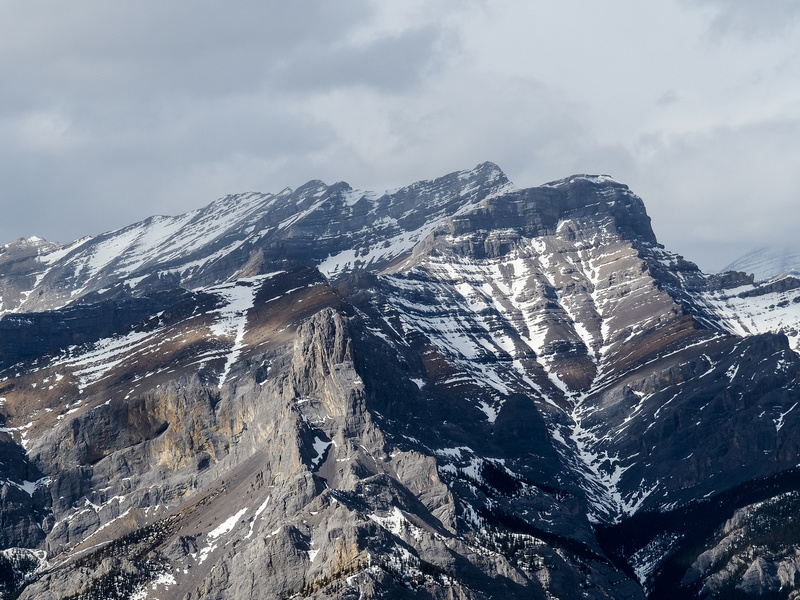 At the time, Raf indicated that he was going to attempt the SE ridge next, which looked to be “less than 5.5 climbing” – but obviously still looked fairly intimidating from his angle on the upper ridge. Fast forward to June of 2014 and Raf was back at it – determined to bag End from Association! And he did! By utilizing an impressive route around a large ledge system on the west side of the traverse from Association to End, Raf and his group managed to squeeze their way up a rock chimney to access the rubbly summit slope of End and tag the peak via a ‘new’ (not widely published) scramble route. For some reason I didn’t read of too many folks attempting this new route until Phil Richards and some friends did a combined run / scramble of Association and End in an extremely fast 8.5 hour day via the Yam shoulder in late February 2016 and found another ‘new’ (unpublished) moderate scrambling route down the east face of End just south of the east ridge – no 5.5 climbing necessary! Thanks to social media, it would only take a week or so before hordes of eager scramblers, including myself and Mike (and at least 3 others already! ), would take advantage of Phil’s trip report of the new, easier route to the summit of End Mountain via the east face / ridge. I’m not sure why Association and End are so popular but folks seem eager to bag them in the scrambling / hiking off-season. 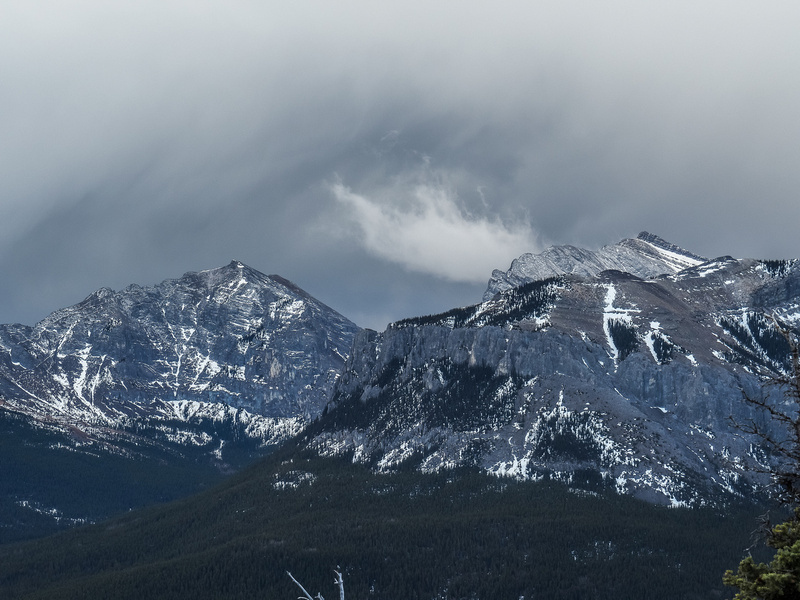 I think it must be pent up scrambling energy combined with the fact that these two peaks are both easily visible and impressive from hwy 1 when approaching the Rockies from the east. That’s certainly the case with me anyway! I’ve done the Yam shoulder height gain / loss several times including for Wendell, East End of Wendell and even Association Peak (before I knew it could be combined with End). I was wary of the long, tiring approach and was surprised myself that I was doing it yet AGAIN after swearing it off the last time! I told Mike that although I was keen on tagging End, I was not going to ascend Association for a second time. Initially the plan was that we would ascend End up the east face / ridge rather than descending it, and then Mike would proceed to Association Peak while I would descend our ascent route and tag Association Hill before we’d meet up again lower down on the approach trail. You know what they say about plans right?! 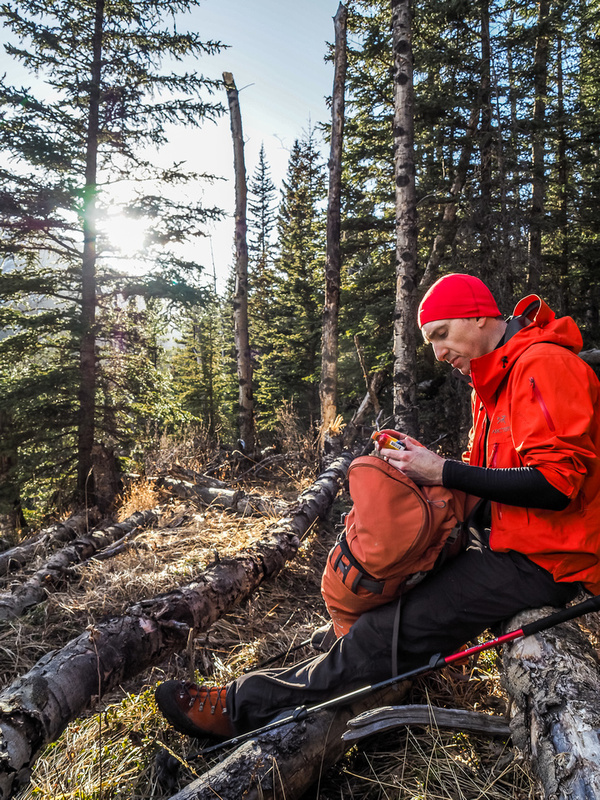 I remembered the general theme of the approach route that Bill, Wietse and I took on Association Peak back in 2013, but thanks to a data purge on my part, the GPS track was lost to me which resulted in us making some minor navigation errors. 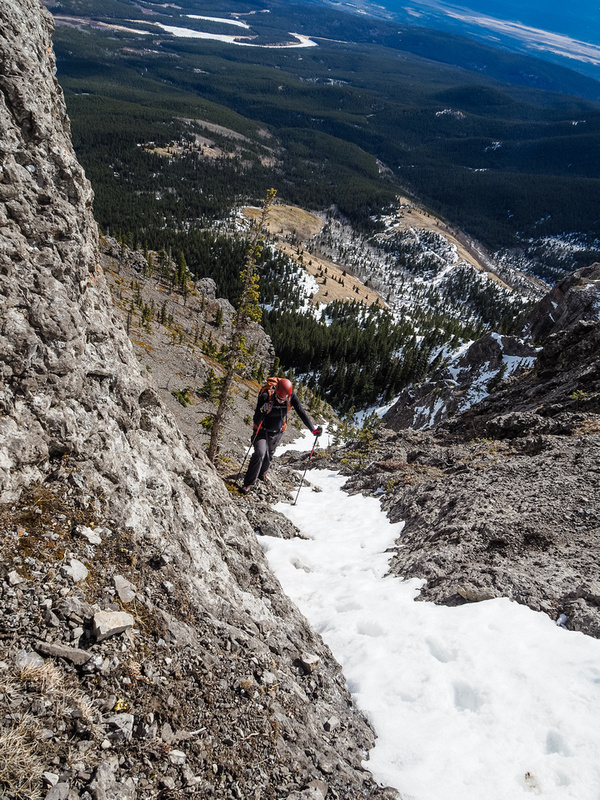 The gist of the shortcut route over the Yam shoulder is to use a cut line on the very edge of the Provincial Park boundary to gain height about half way up the shoulder before trending climber’s right around the east nose of the shoulder on lightly forested / open grassy slopes. 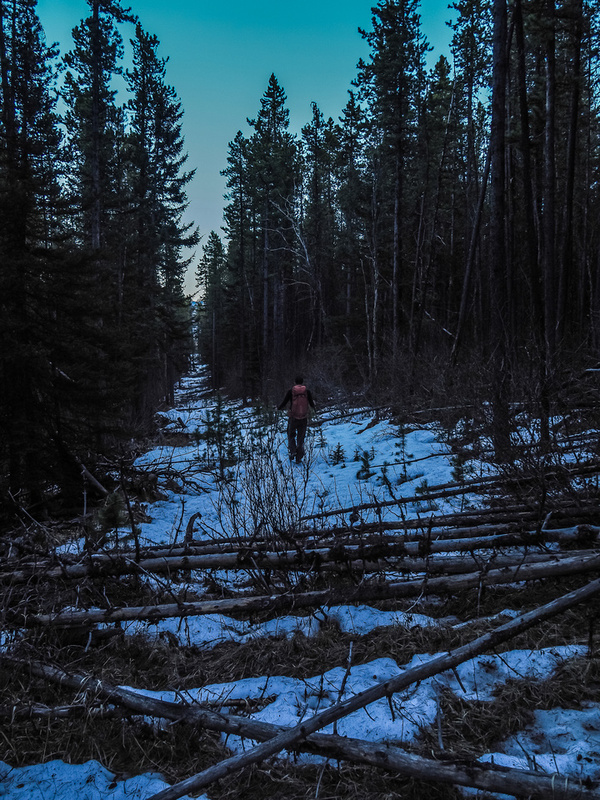 Once around the nose, there are several old roads that can be used to navigate down to Old Fort Creek. From the creek bed the route is obvious and eventually joins with the more traditional Yam shoulder route. The morning flew by pretty quickly until we hit the old roads, which were covered in a disappointing amount of snow. 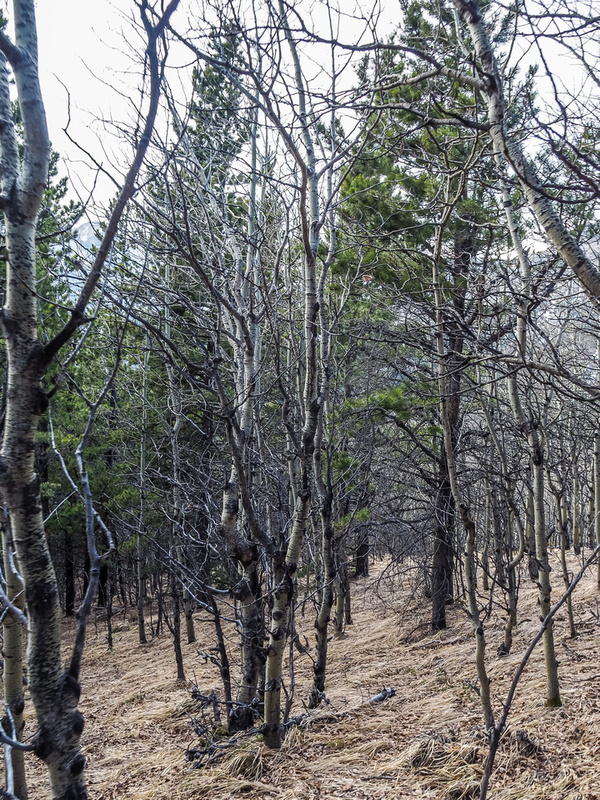 The forest beside the roads was almost completely melted out. 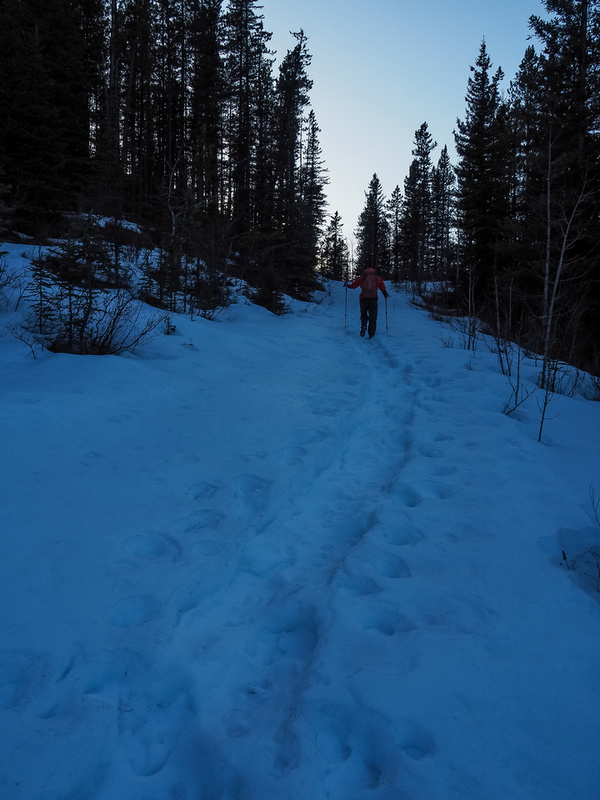 Thankfully there were some old animal and snow shoe tracks that supported our weight, but it did slow us down a bit. Once we finally descended to Old Fort Creek we had a great view of all three destinations ahead of us – a LONG way ahead! 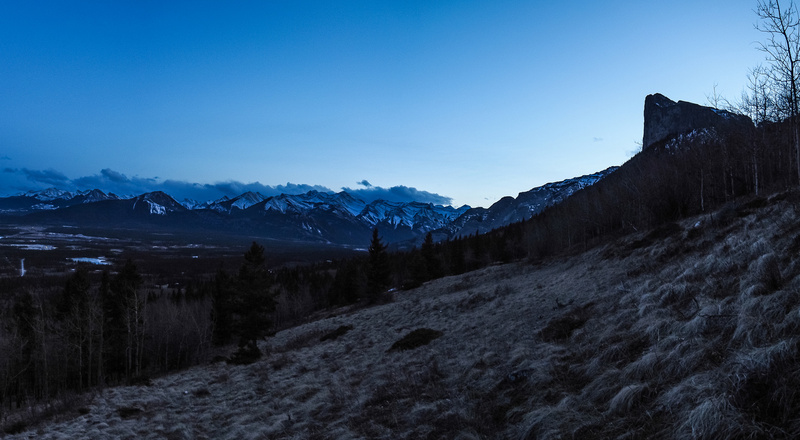 We followed the dry creek bed and flowing stream up valley before taking the obvious trail (cairn in the creek bed to the left of it) to the Association col between the peak and the hill. My dumb knees were feeling a bit weak all day already to this point but I decided my cardio was still good so stubbornly pushed on. 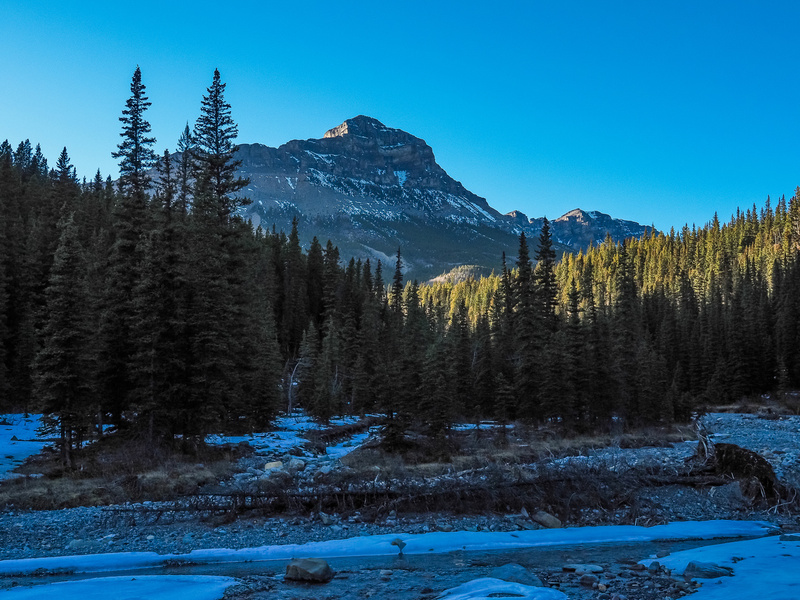 Hiking alongside Old Fort Creek with Association Peak in the distance, End just visible through trees to the right. The road from the col down towards End Mountain was again, covered in snow. 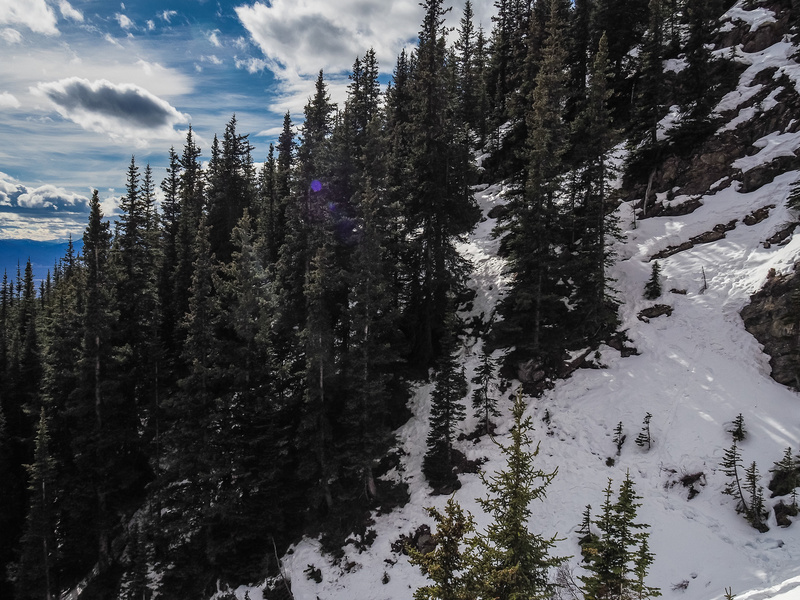 As a matter of fact, the bowl between the lower Association and End slopes had quite a bit of snow in it and we ended up in knee deep patches on our traverse towards the northeast end of End. The route was pretty obvious to this point and there were many approach options. Gullies along the way added some interesting bits of terrain. Higher than Association Hill (left of center), looking back at our approach and Association Peak on the right as we work our way up the gully to the east ridge of End. Mike starts the traverse from the east ridge view point towards me, under the first set of cliff bands. 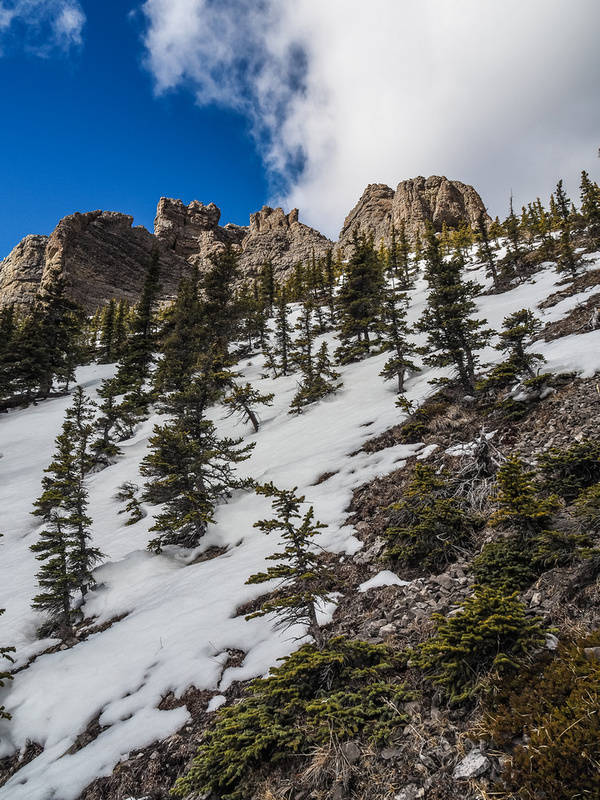 Once I arrived at the bottom of the SE gully off the east ridge of End, I carefully followed Phil’s GPS track towards impressive pinnacles towering high above. 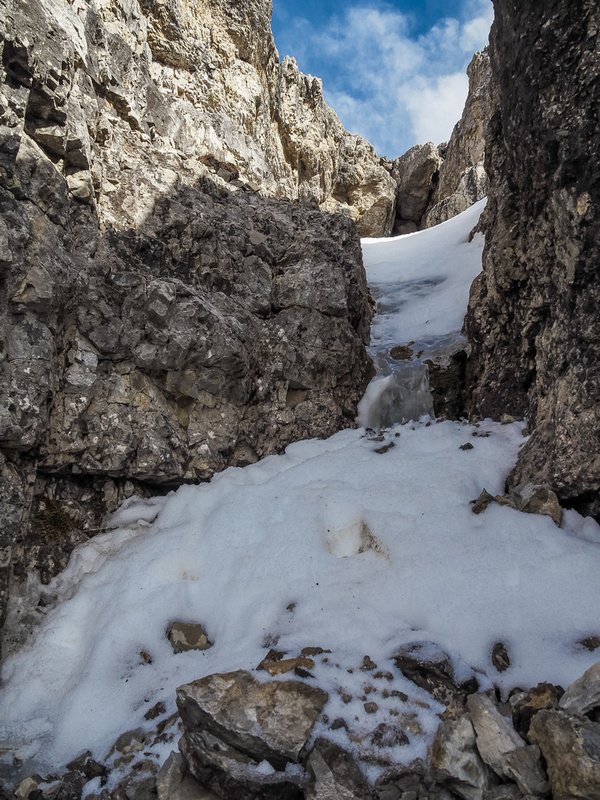 A traverse between two lower ridges took us across a steep, icy drainage. Make sure you catch this traverse as the drainage could be problematic to cross higher up, especially with snow and ice like we had. 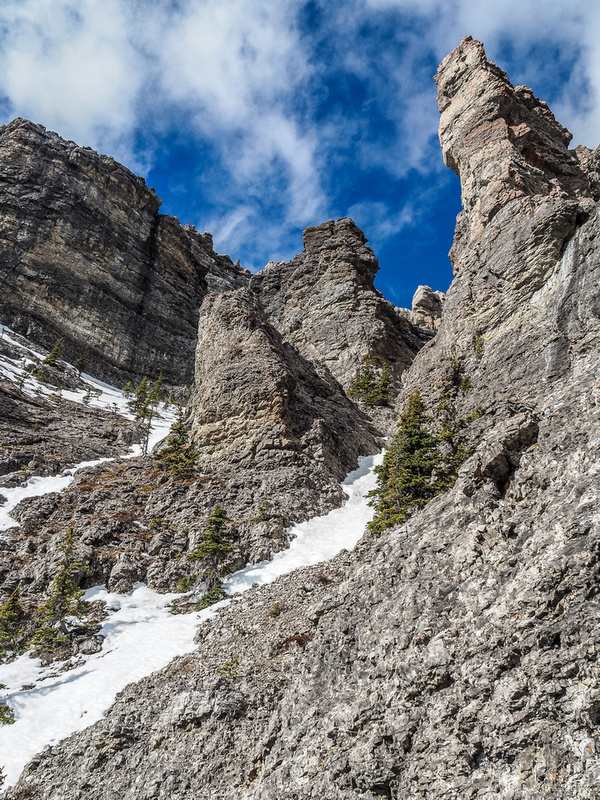 The obvious pinnacle soaring above us was a great route marker as we slowly gained height beside it on climber’s right, but still well to the left of the east ridge proper. We gained height on loose scree and grass before heading right to the edge of the east ridge to check out the rest of the route from there. Note the ‘zag’ in the approach route on the east ridge of End through the letter ‘t’ that crosses a stream. This is one key navigation point. 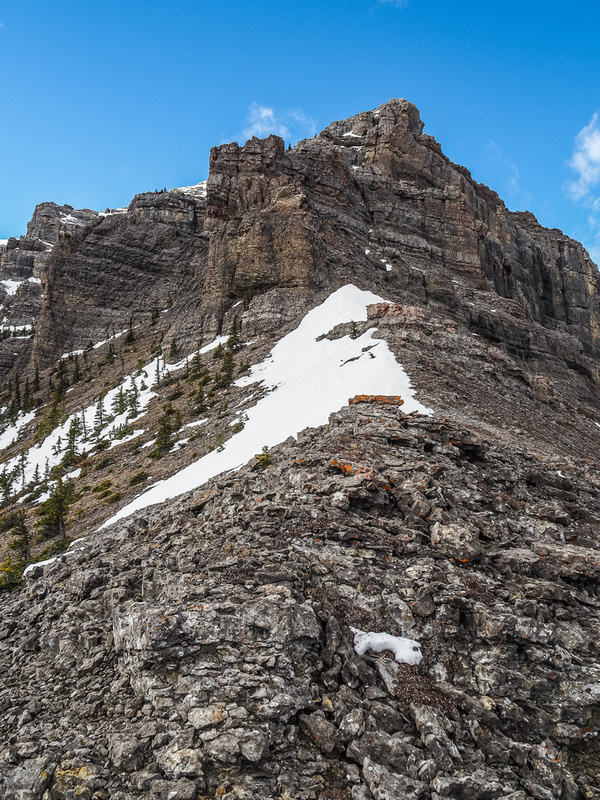 Another is the ‘zigs’ up to the main summit higher on the east ridge where the route deviates south off the ridge and the descent chimney and proper ledge on the west side of End to Association. This is looking at the route ahead and the ‘moderate’ scrambling section where you really don’t want to slip! 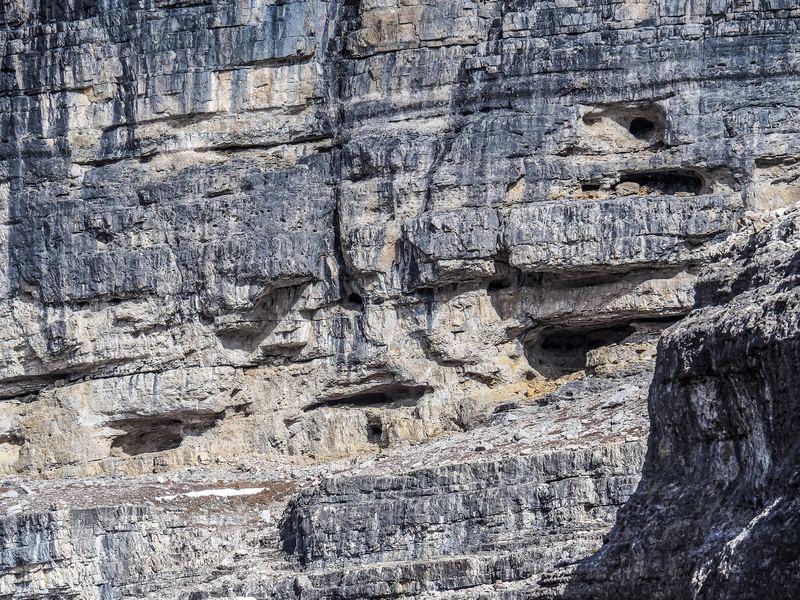 The route goes left along the bottom of the photo and then up grippy limestone into the second gully on the left. From the east ridge proper, we had great views north to Black Rock and Phantom Craig but our view of the east ridge was very intimidating! 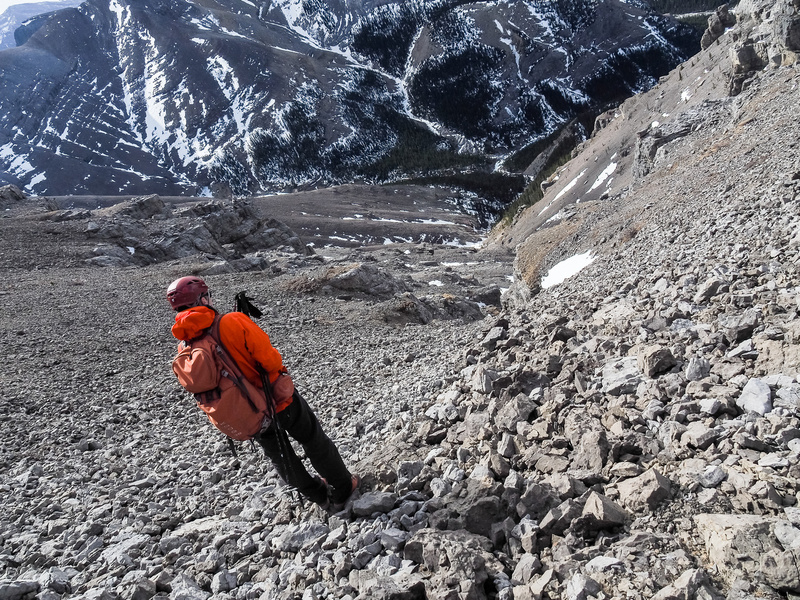 Thanks to Phil’s route description and GPS track, we knew that we had to traverse climber’s left under some serious cliff bands, and pick our way up to the summit of End, through loose gullies and under several pinnacles and cliff bands. Even with a GPS track, we managed to get off route a few times due to the tight terrain, but keeping in mind that the route is only ‘moderate’ scrambling, we managed to find our way through. I built several cairns to assist myself on descent as Mike would be needing my GPS to continue on to Association afterwards. There were some slabby, slightly exposed sections through here that had serious consequences for a slip. I recommend only small experienced groups tackle this route – especially if you are descending it ‘blind’ – i.e. coming down without going up first. For reference, Association Peak is extremely easy hiking compared to End. 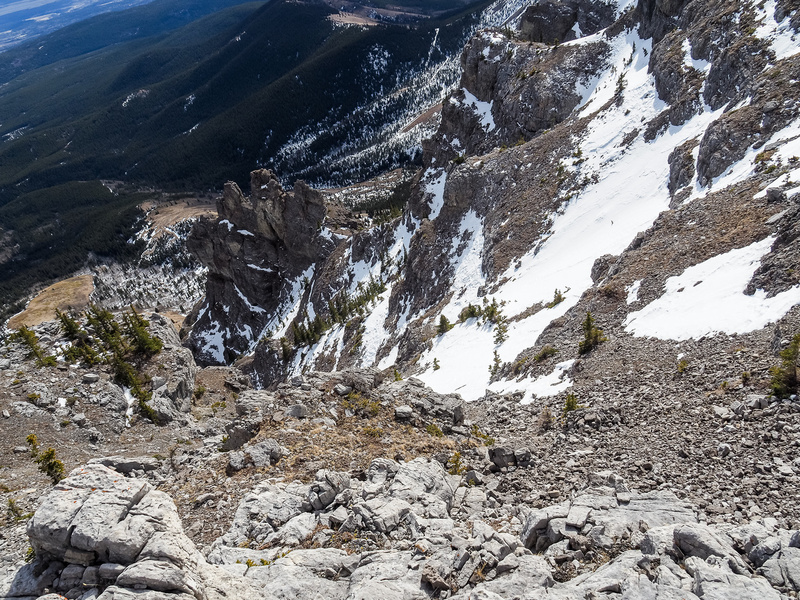 The final open scree slope to the summit was a bit of a drag, but soon we were standing on the summit of End Mountain with great views in all directions. Dark clouds were looming to the west, but didn’t seem very close at this point so we didn’t worry about it. Even the infamous Chinook winds were pretty tame and we enjoyed a quick break before continuing our separate ways. 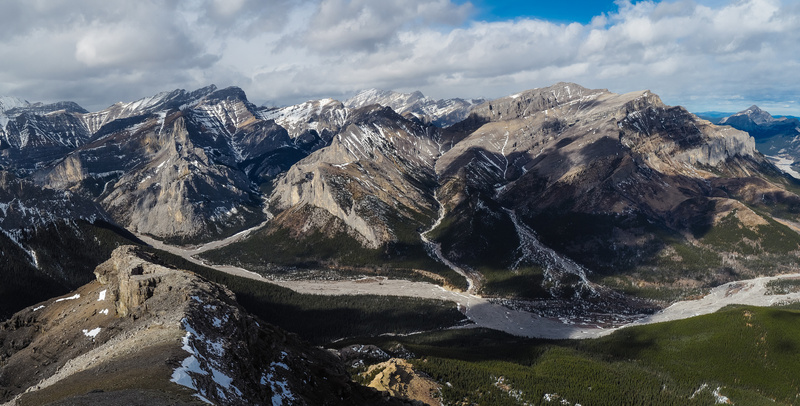 Spectacular views to the west, north and east off the summit including the South Ghost River in the fg and Fable, Charles Stewart, Peechee, Girouard, Inglismaldie, Saddle, Costigan, Orient Point, Phantom Crag (might be hidden) and Black Rock mountains beyond (L to R). 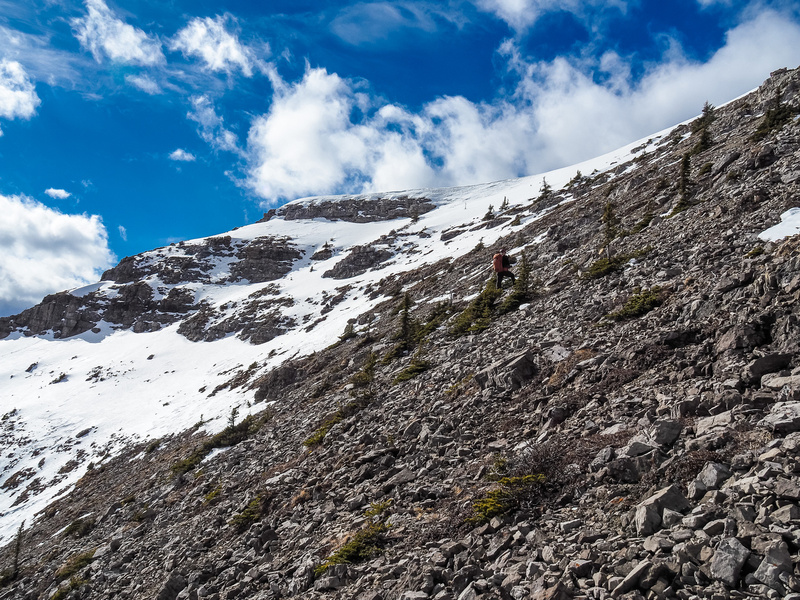 Mike starts the traverse towards Association Peak – it looks so easy and close from here!! Just as Mike was leaving for his traverse to Association, I had a change of heart and decided the better option was for me to join him, rather than go back down End on my own. There were two reasons for my decision. Number one was the safety factor. 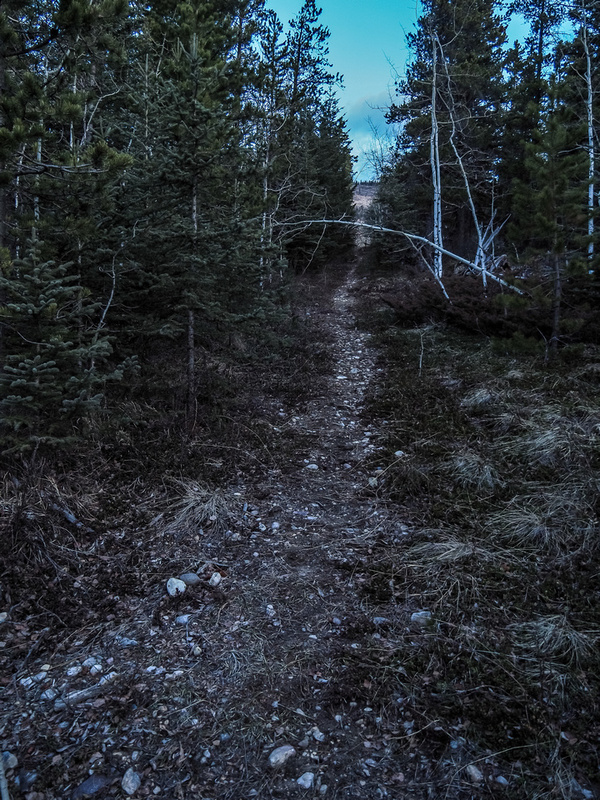 We’re both experienced scramblers but separating our paths, this far from the car and with all the navigation issues involved in both routes had me concerned. 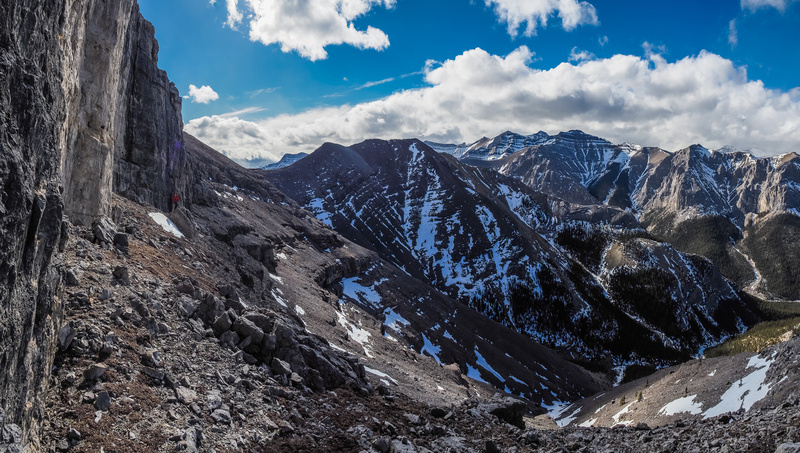 Number two was the fact that the ledge traverse looked fun and interesting, while the return via the east ridge of End to the Association col wasn’t that exciting. 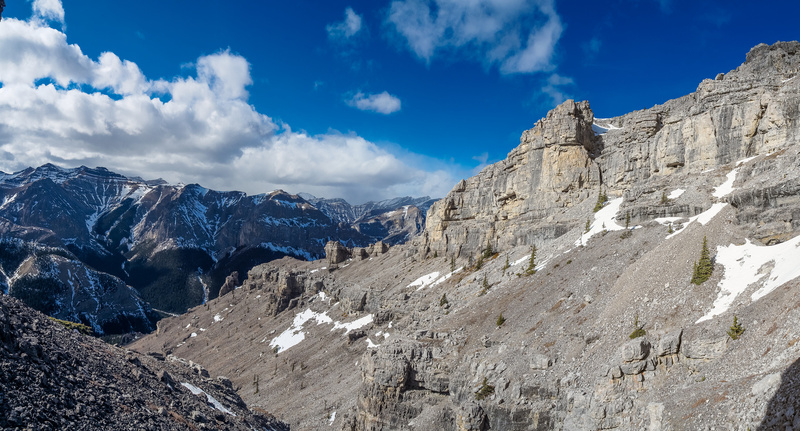 We followed the south ridge of End for a couple hundred meters to the next high point before trending down to skier’s right – aiming for the chimney that Raf’s group used to break the line of cliffs. Even with a GPS track this chimney wasn’t entirely straightforward to find from above. Being 15m off Phil’s track meant we were 12m higher and 3 meters east, separated from his ledge by a serious cliff band! 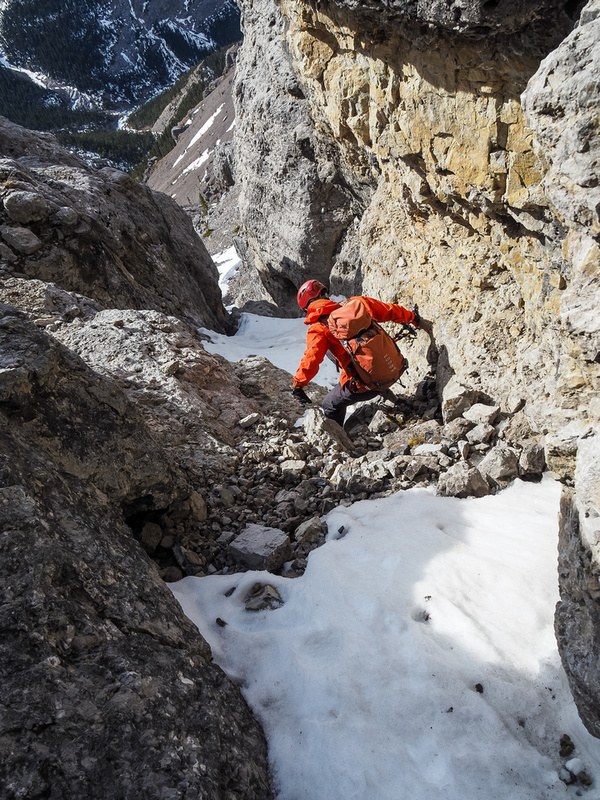 We saw a choke stone in a steep gully but with no obvious way over it, we tried descending skier’s left alongside and got ourselves cliffed out pretty quick. After kicking rocks down (very loose terrain), I was surprised to see someone on a wide scree ledge beneath us, probably sheltering himself from the barrage we were sending down his way! We yelled back and forth – he was wondering where we came from and whether or not he was at the correct chimney to escape his ledge. 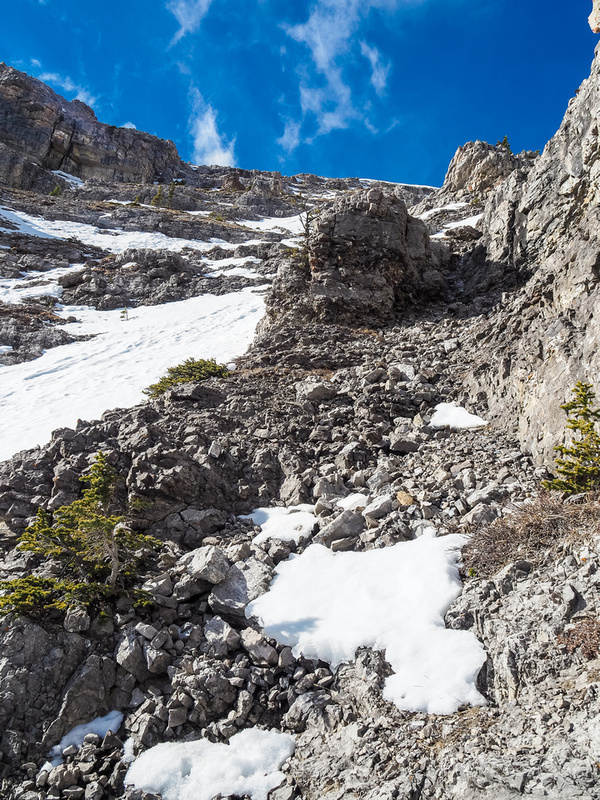 We figured out that he probably was, and soon he was scrambling up the gully as we made our way towards it, now beneath the choke stone on skier’s left of it. We could have stayed higher here but dropped down instead and went around the far corner on the lower lodge at the level Mike is now. You can see a big notch above Mike to the left – this is the reason a direct route is difficult between End and Association. Another look along the impressive cliff band blocking the traverse. After the crux, we still had to pick our way along the ledge to the Association col. We didn’t have any issues and enjoyed the terrain / scenery along the way immensely. I was very happy with my decision to join Mike, even if it meant pretty much re-ascending Association Peak. At the col, Mike continued on easy slopes to the summit of Association while I slowly picked my way down the large bowl to the north. I didn’t find the trail, but had no major difficulties with the descent. 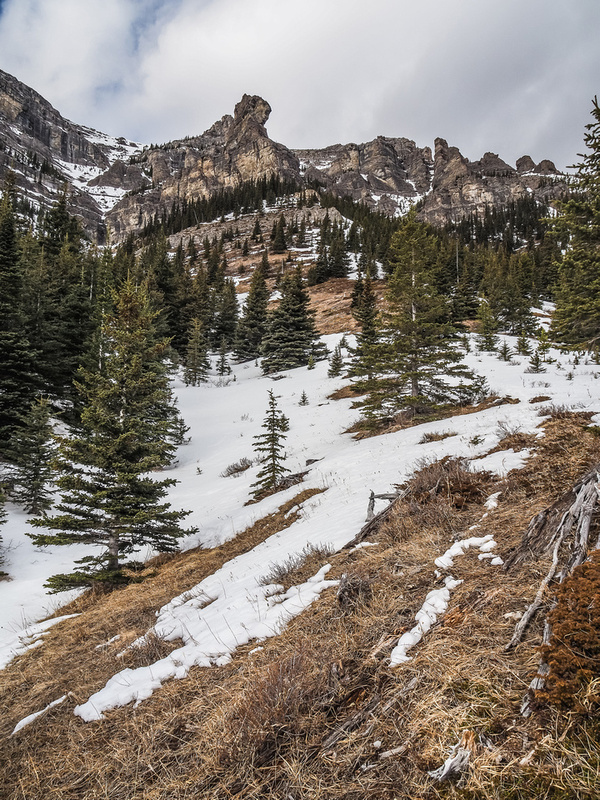 Since I was about 30 minutes ahead of Mike, I lounged around at the pass between Association Peak and Hill and waited in warm sunshine, until it became a blizzard. 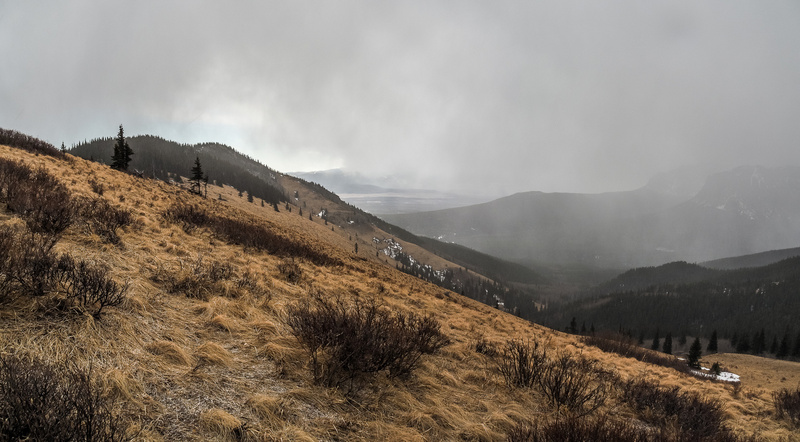 Thankfully Mike joined me just as I was bundling up against the brief snow squall and we headed up the easy NW ridge of Association Hill. Mike continues on easy hiking terrain to the summit of Association peak while I start contouring down here to the far ridge on easy / moderate scrambling terrain. 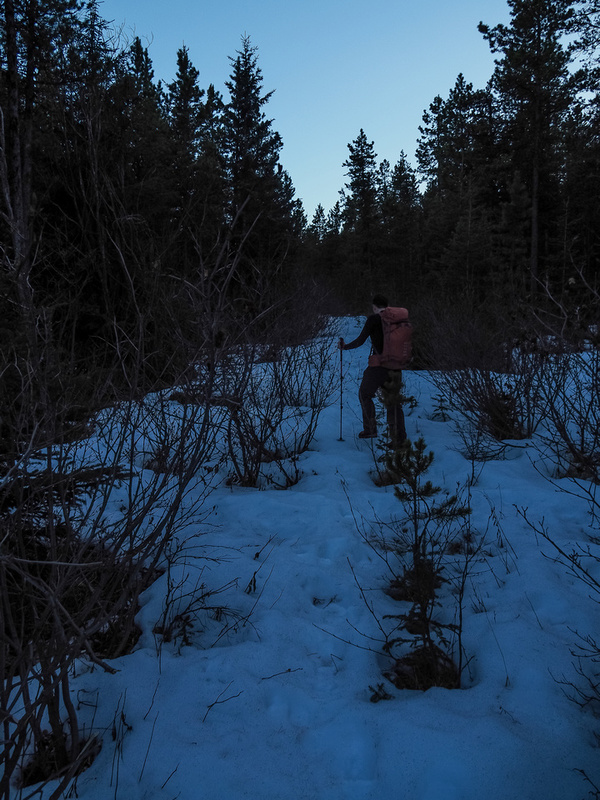 At first light, Mike and headed up the 'shortcut' route to the Yam shoulder from the parking lot. Mike follows me through Birch forest and alongside grassy slopes around the east end of the Yam shoulder. 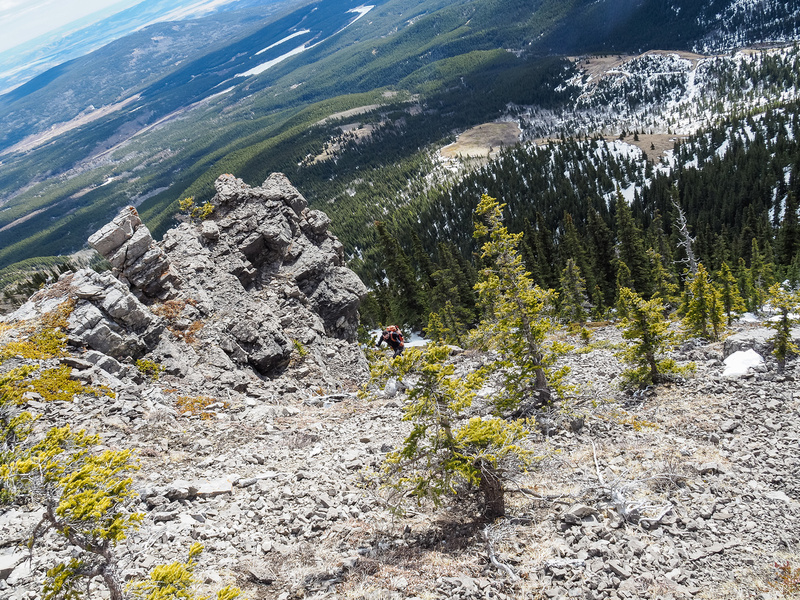 Yamnuska in the background as we continue our traverse. You know you're on route when you see this oddly shaped pinnacle above and to your left. Across the last approach gully now, looking across and up at the pinnacle. Looking across the gully (note the tracks) where we crossed. The terrain above is pretty steep, especially with snow and ice. Looking down at Mike scrambling through the section I took the previous photo from. Looking up at the cliffs that we'll traverse south (left) under - but not until we're level with the base of them. Views off the east ridge are great already - looking north past Phantom Crag and Orient Point to Black Rock (R). 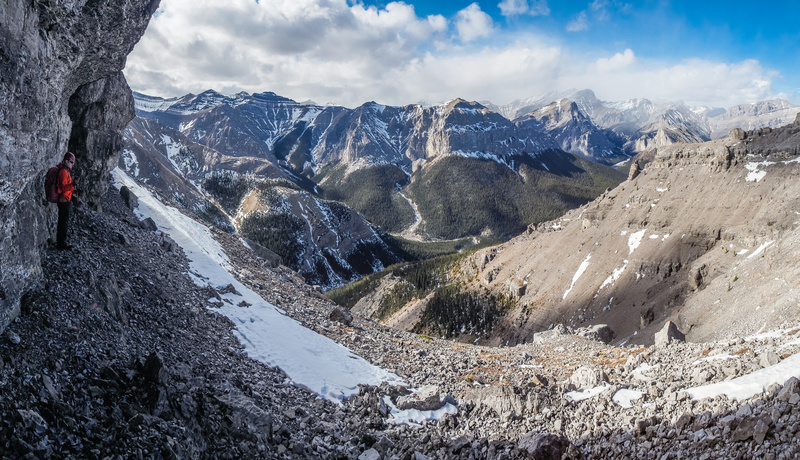 Looking down the lower scree slope that we came up (from the left). 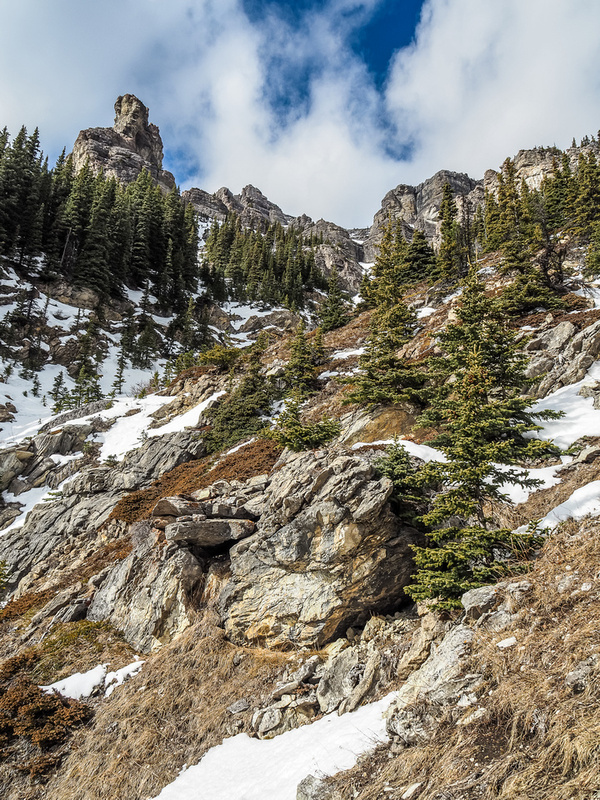 A very natural 'cairn' marks the first key landmark in the traverse south from near the east ridge across the east face. This is obviously looking back. 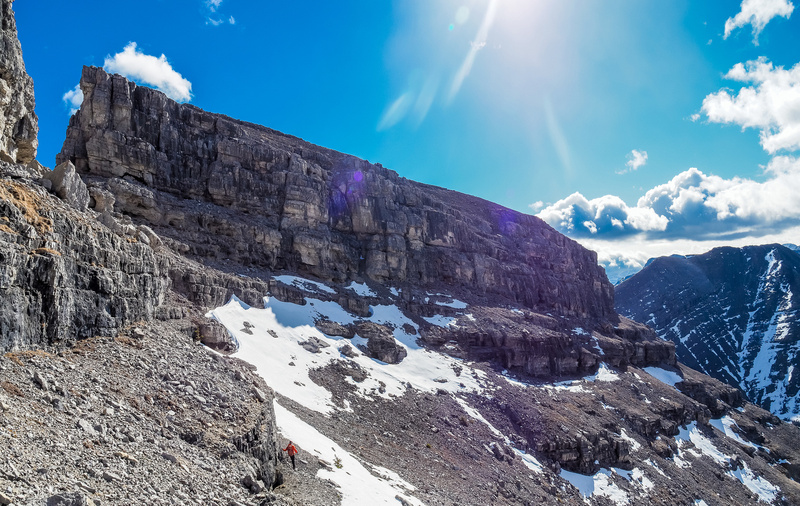 The route goes left along the bottom of the photo and then up grippy limestone into the second gully on the left. The same place as the last two photos, but this time I'm looking east and south to Association Hill and past the Pinnacle (R). Mike comes up behind me. Looking down the moderate section - you can spot the natural cairn along the base of the cliff on the left, just under the line of trees. Looking up at the final scree grunt to the summit of End, from the top of the moderate section. Still lots of loose terrain here - a large group is not advised. Looking down the scree / slab slope below the summit - note the pinnacle - the route traverses down this gully and then away from that pinnacle to skier's left. Plodding up easy slopes to the summit. 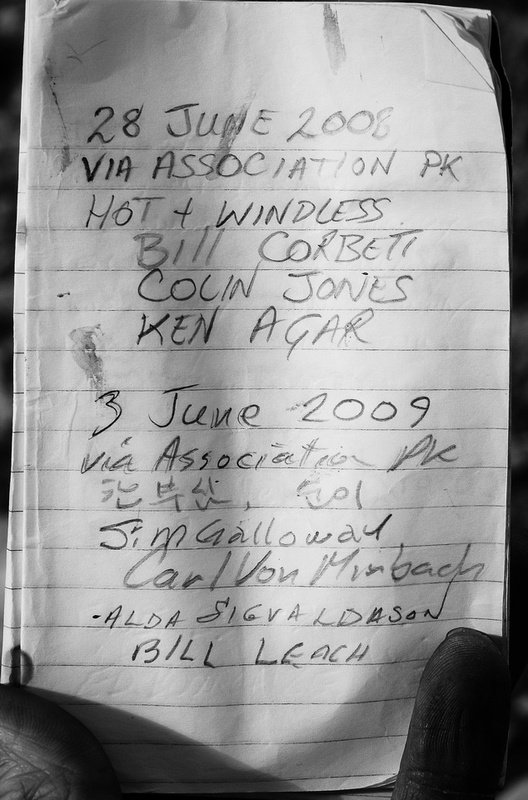 Interesting register with the indefatigable Rick Collier placing it of course! Kane and Thorstenstein were up here in '89 so likely it was their register that this one replaced. Some pretty famous local signatures in this register - and not many others. Ole Buck, Cox Hill, Moose, Baldy, Bryant, McDougall, Fisher, EPOW, Wendell, Morrowmount, Fable, Charles Stuart, Peechee and others. 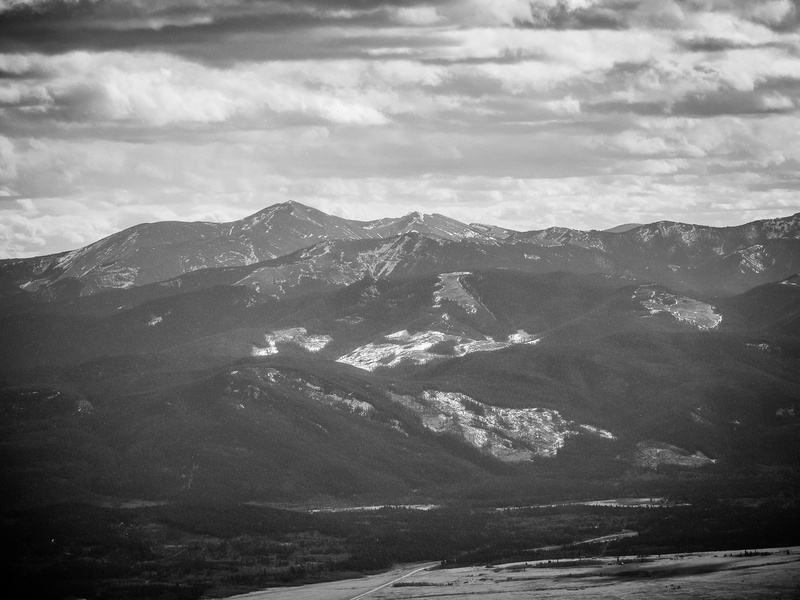 A great view over the South Ghost towards, Orient Point, Costigan and Saddle (R to L). It's snowing on Fisher Peak to the south. 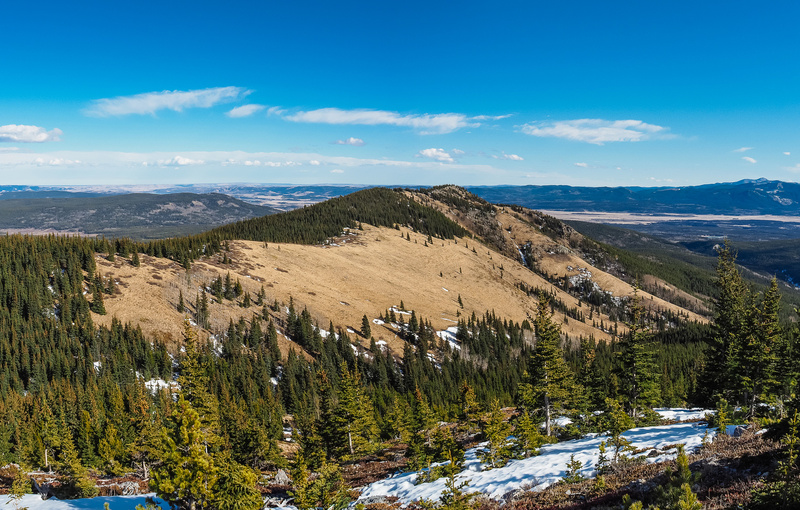 Another view south, over the TCH at Cox Hill and Moose Mountain. 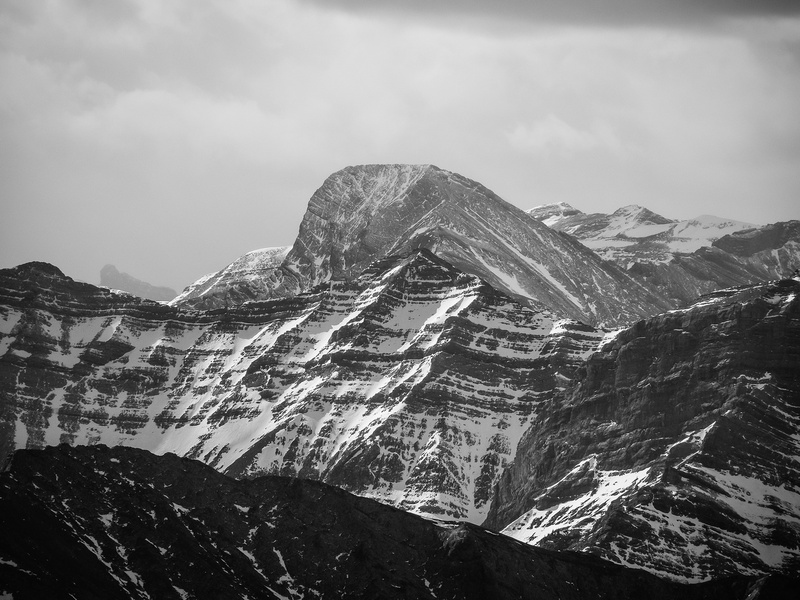 Mount Fable shows up over the twin summits of Morrowmount in the foreground. 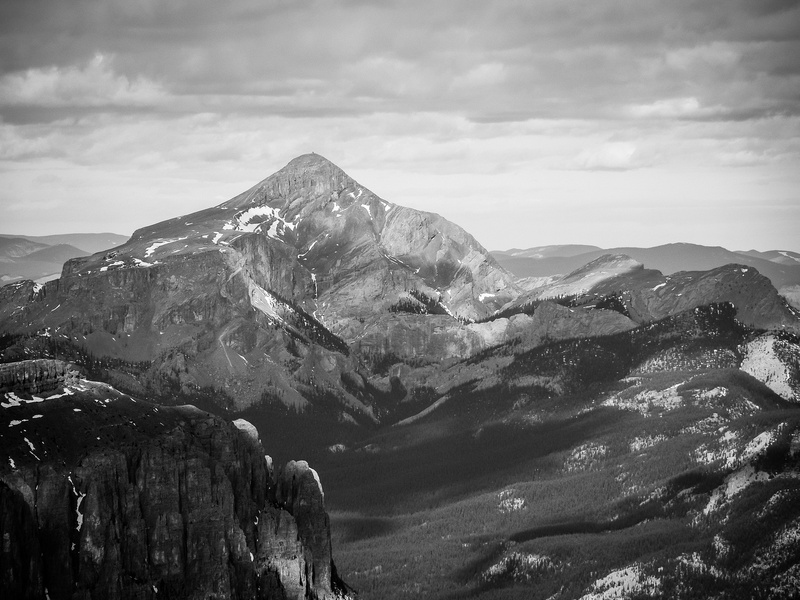 Mount Costigan is high on my 'to-do' list. A gorgeous wall of rock on the south side of Orient Point. 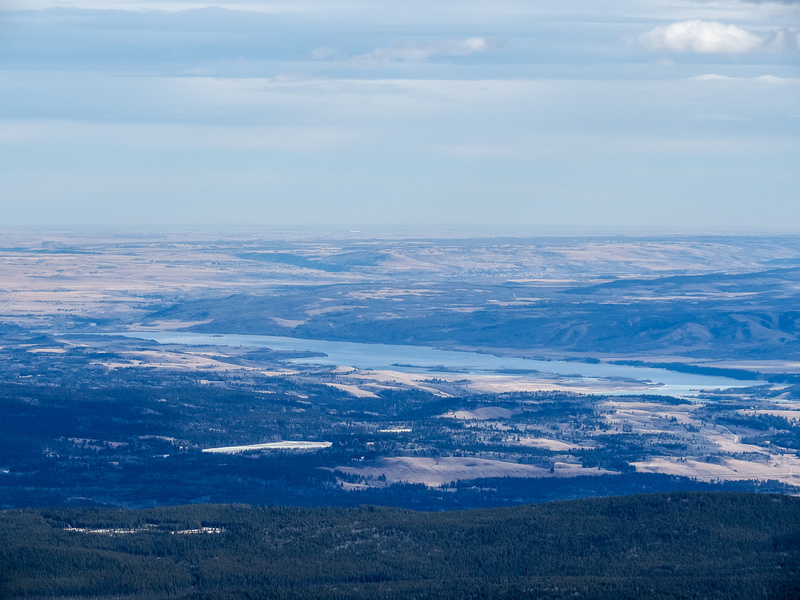 The Ghost Lake reservoir is clearly visible to the east. 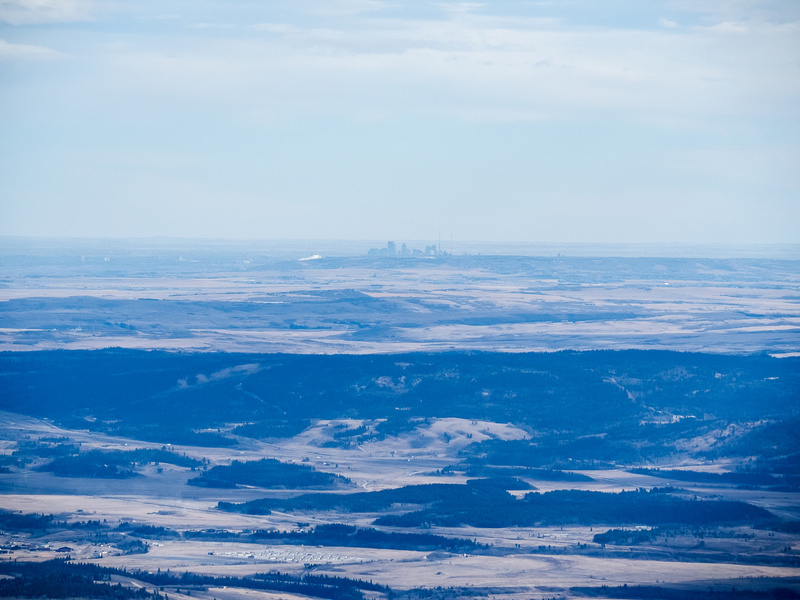 The city of Calgary is visible across the plains to the east. One more shot towards Black Rock over the Ghost River before it meets with the South Ghost - Orient on the left. Mike starts the traverse towards Association Peak - it looks so easy and close from here!! Looking back along the summit ridge of End as we traverse to the chimney (below to the left here). The easier route to the chimney descends to the right of it here, before trending back left into the chimney well below the chockstone . Looking for the route. We're too far north here - the chimney is just behind Mike here. Looking down the chimney from where the cairn route exits or enters depending whether you're approaching or leaving it. Mike stems down the chimney, trying to stay off the ice. Looking up the chimney at the top chockstone . The route out of the chimney is just above this spot to climber's left. 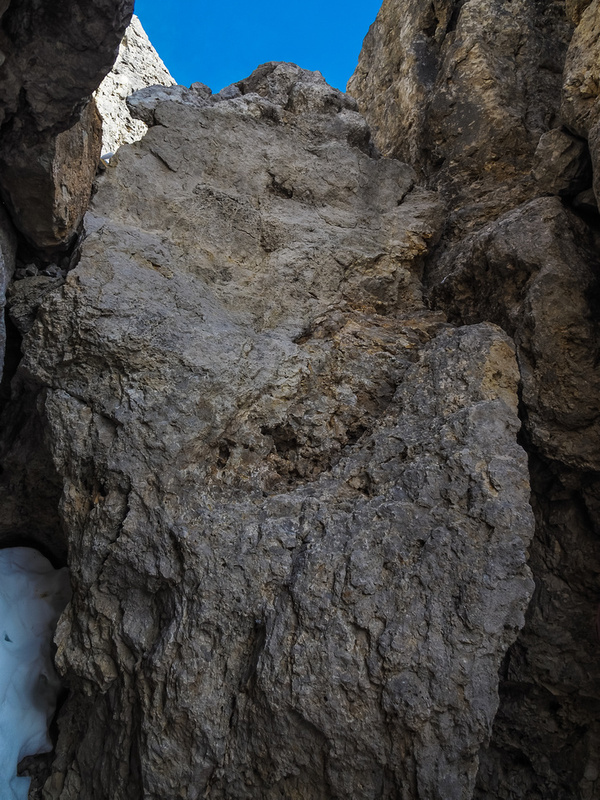 The entrance (or exit, in our case) to the chimney from the scree ledge. Part way along the ledge traverse, looking back at the area around the escape chimney. You can see a big notch above Mike to the left - this is the reason a direct route is difficult between End and Association. Another great vantage point along the traverse, looking back towards Costigan and Orient Point. This erosion is both impressive and terrifying. Almost done the traverse - soon we would head up to our left on easy scrambling terrain. Looking back at End Mountain - the notches not visible from here. The sun is already casting long shadows as I work around the east end of Association (shadow in the fg). End Mountain rising impressively on the left. After we successfully scrambled End Mountain, Mike and I set our sights on my second and Mike’s third summit of the (long) day. There is no good reason not to hike to the summit of Association Hill if you’re in the area anyway and you’re a peakbagger. Personally, there was no way I was going over the Yam shoulder for a 5th time so I had planned End and Association Hill from the start. Mike figured he might as well have a nice three peak day and joined me. 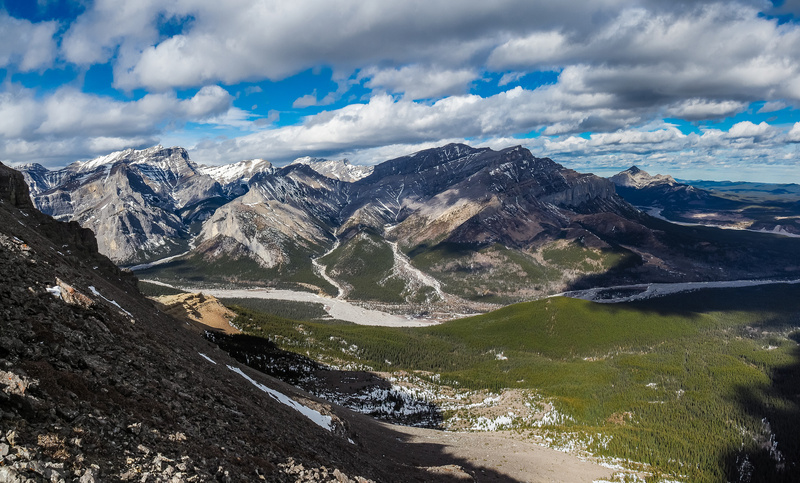 The best part of Association Hill is that it gets you part way back to the parking lot so other than the 100 meters of height gain from the col, it’s pretty much a free summit with better views than expected. 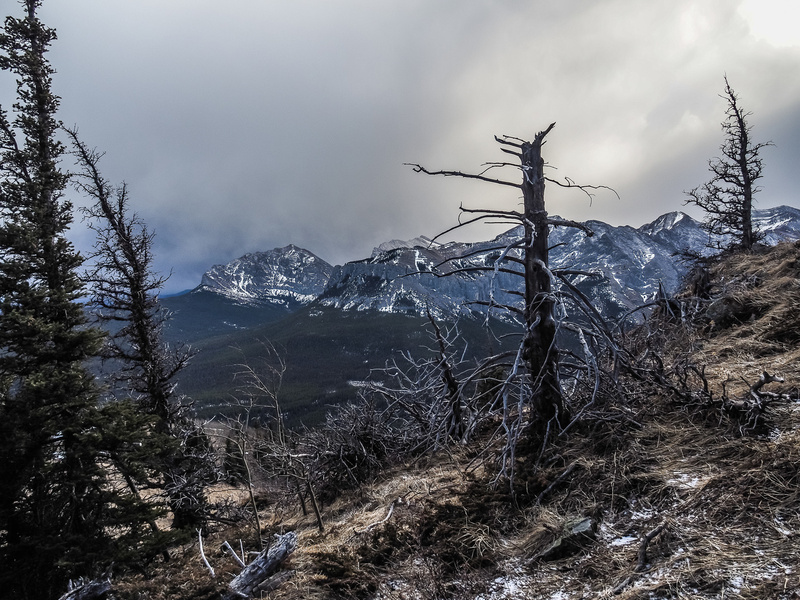 We started our hike in a mini blizzard – accurately predicted by SpotWX.com to within 30 minutes! Just as predicted, by the time we reached the summit the views were back and the sun was out. That is the most accurate forecasting I’ve experienced in a while. After a few photos at the summit it was time to turn our attention to the long way out, especially as sunset was in about an hour. The storm is already clearing as we work our way to the summit of Association Hill. 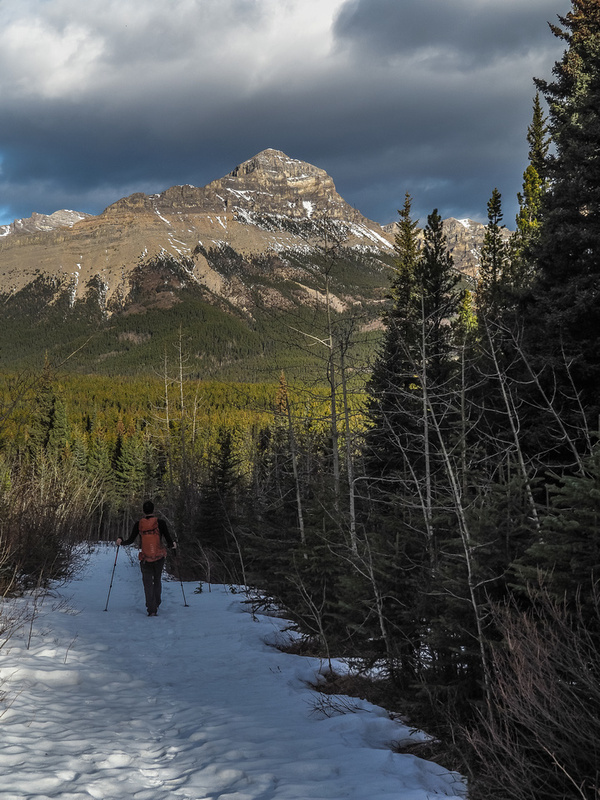 We quickly exited the light forested slopes on the south end of Association Hill before linking up with the approach track from Old Fort Creek. At the creek we filled our empty water bottles before slogging the rest of the way to the truck. We needed head lamps for only the last 10 minutes or so. All-in-all this was a great 11.5 hour day in perfect spring-like weather and conditions. I didn’t need gloves or a toque all day, even at the various summits, other than the last 20 minutes or so. Can’t complain about that in early March! Association Hill seen from east slopes of Association Peak. Hiking up Association Hill in a temporary blizzard. 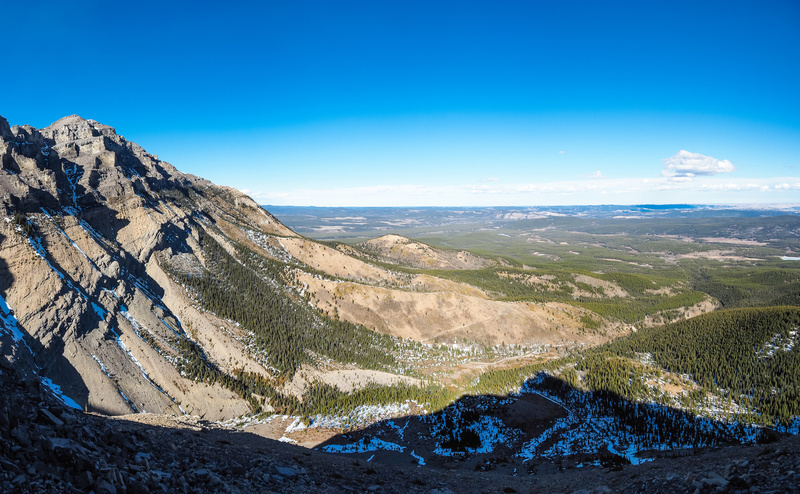 The views towards Yamnuska, EPOW, Wendell and Morrowmount (L to R) are pretty good. 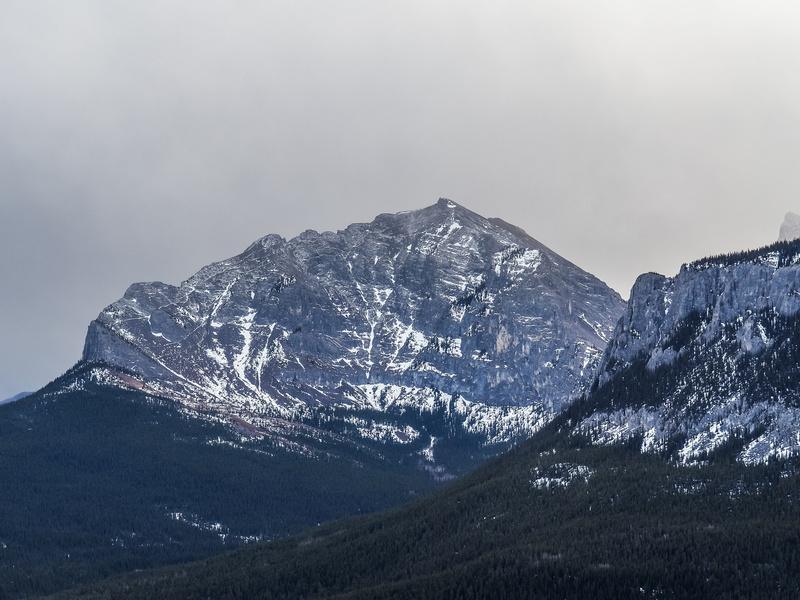 Yamnuska on the left and Wendell on the right. 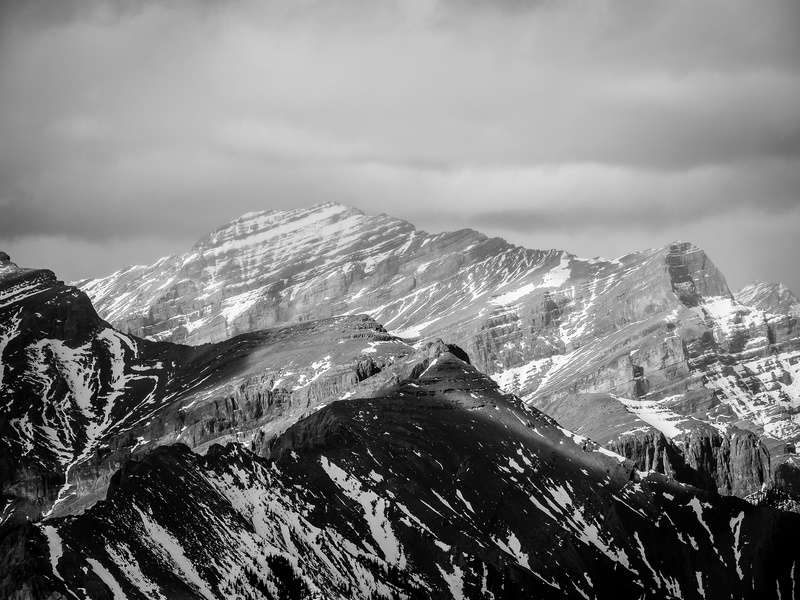 The twin summits of Morrowmount. 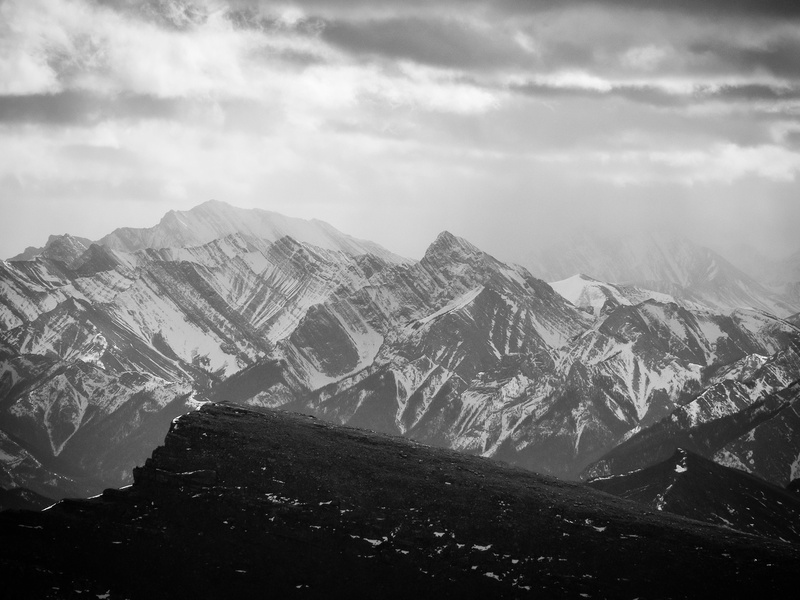 Looking back along the summit ridge of Association Hill with Association Peak and End Mountain (R) looming above. 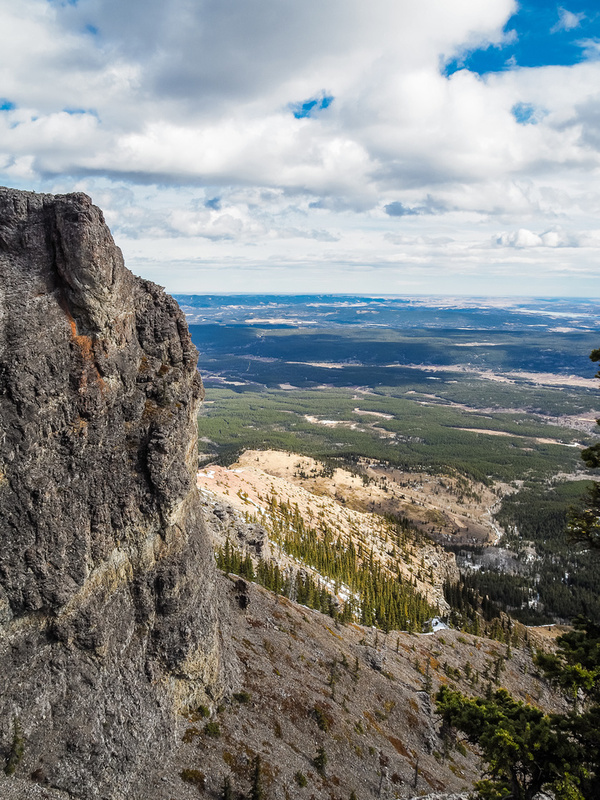 Interesting views off the south ridge of Association Hill looking towards Yamnuska - where we have to go next! We have to hike all the way past the mountain in the far distance here - Yamnuska - hopefully before dark! 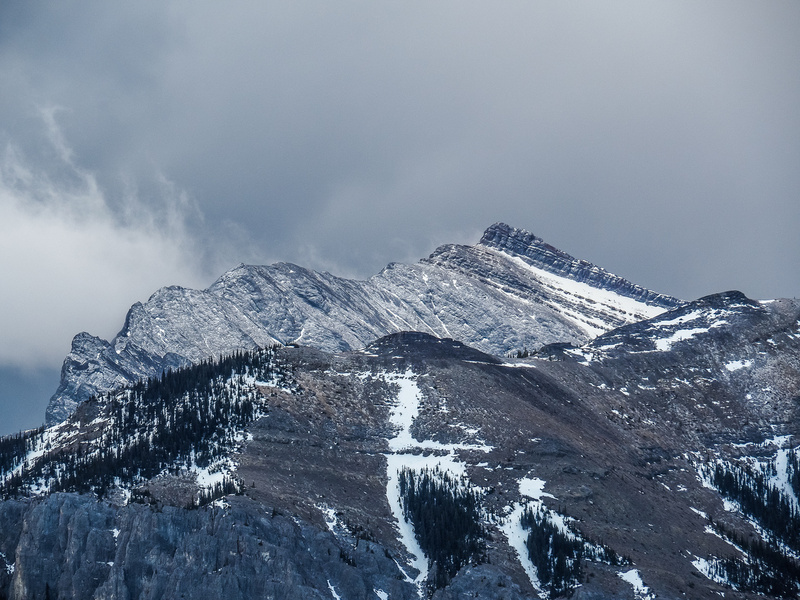 Telephoto of the north side of Yamnuska, note all the scramble trails up to the summit from the left. Light birch forest and dead grass. For some reason, I really love this type of terrain. 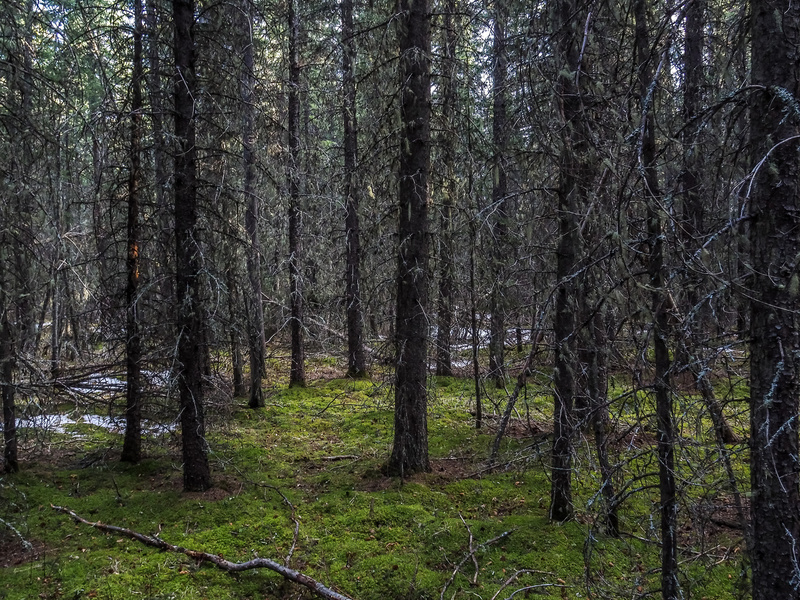 Melting snow and green mossy carpets define the lower forest near Old Fort Creek. Taking a break just before linking back up with Old Fort Creek. Last views of Association Peak (L) and End Mountain (R) as we exit the valley and enter the maze of old roads and trails up and around the Yam shoulder. Thankfully our approach track was pretty supportive even after a very warm day! This section would have been HELL if the snow went isothermal on us. Don't expect fully clear roads - they're quite over grown in places. The roughest section of road runs across the east nose of the Yam shoulder. Yam's south face and evening light as we round the shoulder and head for the shortcut route back to the truck.